In the comments of our last post on The Outsiders fashion, we found many fans of the book’s setting, Tulsa, Oklahoma. Inspired by the hometown spirit, I decided to look at the history of my own beloved Tacoma, Washington, and selected not only a fellow T-town dweller, but also a former student of the University of Washington: Frank Herbert, author of the sci-fi epicDune! Dune is an iconic work of science fiction, covering political upheaval, court intrigue, and romance on the kind of grand scale that only sci-fi novels can provide: We’re talking multiple warring planets and families caught up in the schemes of a manipulative empire. The novel focuses on the dealings of the House Atreides (especially the heir of the family, Paul, and his concubine mother, Lady Jessica) after Paul’s father, Duke Leto Atreides, is granted control over the desert planet of Arrakis (the most lucrative and inhospitable fiefdom in the empire), a move made by the suspecting and double-crossing emperor in hopes of eliminating the family, because of their status as a dangerous threat to empire control. Many consider Dune to be the best science fiction epic ever written. It has received widespread positive reviews ever since its original publication, and even the prolific sci-fi author Arthur C. Clarke called it most comparable to Lord of the Rings. 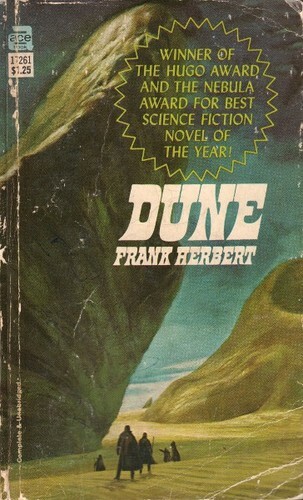 It won the Hugo Award in 1966 and the first-ever Nebula award, and spawned the rest of the lengthy, and still best-selling, Dune saga, as well. Dune has been adapted into one major motion picture, and one miniseries for the SyFy Channel. The movie itself, produced in 1984, was a failure with fans – who critiqued the dissimilarities in plot – as well as with wider audiences, to whom the mythology of the novel proved nearly incomprehensible. The miniseries, produced in 2000, fared better with critics, and was, up until 2004, one of the three highest-rated programs on the still-growing SyFy network. Plans for another film adaptation were made in 2008; however, after numerous departures from those in head positions, the project was finally scrapped in 2011. As with other science fiction works, the fashion present within the context and culture of the novel might prove difficult to translate into everyday looks. With the unique pseudo-historical context of Dune’s societal structures – a mix between the futuristic and the feudal – this difficulty is increased even further. However, that’s not to say that it’s impossible: plenty of hyper-futuristic looks have hit the runways in the past few years, from the liquid legging trend to the holographic trend, and the digital prints trend. By integrating key thematic elements from the novel into your daily looks, you can also pay homage to one of the most enduring science fiction epics of all time, without having to travel to outer planets to do it! Product Information: Skull Tee – Tillys, Faux Leather Pants – Kohl’s, Bomber Jacket – Nasty Gal, Linked Metal Necklace – Dorothy Perkins, Gladiator Sandals – Asos, Aviator Sunglasses – Metro Park. The essence of the story focuses on the coming-of-age – and coming-to-power – journey of young Paul Atreides, following his growth from a mourning young boy to a fierce leader of a massive, devoted army. This popular trope within science fiction works – the Warrior’s Quest – entails revenge, political takeover, and an age-old prophecy for our protagonist, and requires, of course, his total assumption of the mindset of a fighter, both mentally and physically. Channel this essence of a warrior by way of edgy statement pieces, like a skull tee and leather pants, paired with the hallmarks of other kinds of fighters, like the sandals of a Roman gladiator, the aviator shades and bomber jacket of a fighter pilot, and the linked metal – in necklace form – of a medieval knight’s chain mail. All of these pieces feature some kind of tie to the stereotypical status of someone who strives to protect, fight, and conquer for those who stand beside him. Product Information: Blue Studded Shirt – Buckle, Faux Leather Shorts – River Island, Desert Boots – Asos, Utility Jacket – Forever 21, Wide-Brimmed Hat – Quicksilver, Dagger Necklace – Forever 21. Within the harsh and unforgiving sands of the desert planet Arrakis, there lives a primitive, yet highly successful race of people, called the Fremen. The Fremen, instinctively and intuitively connected to their surroundings, have developed the uniquely adept ability to thrive in the treacherous terrain. Because of the oppressively hot and sandy conditions in which they live, the entire structure of their culture revolves around the conservation and preservation of water. Draw on this focus of water as central to life by deliberately contrasting it against the harshness of Arrakis’ sandy dunes: build the foundations of your outfit from pieces like a utility jacket, leather shorts, desert boots, and a wide-brimmed sun hat, while allowing the central focus of the look to be a studded chiffon top that’s blue and flowing, like water. A dagger necklace completes the look, for reasons obvious to those who have read the novel! Product Information: Lace Detail Top – Dorothy Perkins, Colored Jeans – Tillys, Suede Flats – Free People, Infinity Scarf – Dorothy Perkins, Top Handle Bag – Metro Park, Earrings – 1928, Arrow Bracelet – Topshop. The main reason the desert planet of Arrakis is such a highly sought-after fiefdom is because it is home to the Universe’s most precious and expensive commodity: the spice “melange,” which can gain its consumer precognitive and computing mental powers, while simultaneously causing instant addiction, with death befalling those who no longer consume it. Because of the importance of the spice, Arrakis is one of the most vital holdings within the Landsraad, and those who control the landscape are almost instantly ensured wealth and prestige. The addiction to spice is married with an addiction to power; whether it is the power granted by the spice itself, or simply by the success that follows it. “Melange” is described in the novel as being very similar to cinnamon. 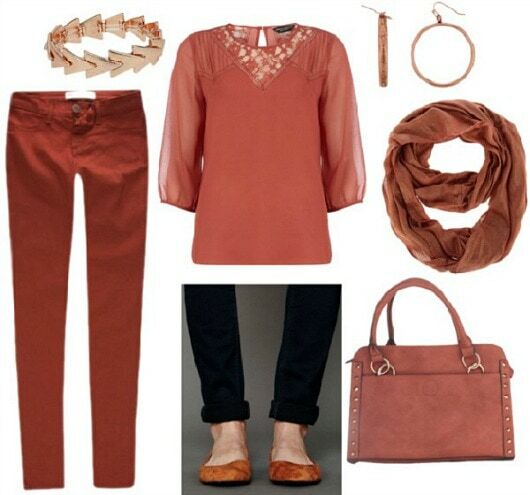 Create an ode to the spice into your own outfit by showing an addiction to that same rust-colored hue, in a take on the monochrome trend, while showcasing status symbols of power within it, using copper and rose-gold jewelry, a sleek pair of colored skinny jeans, a studded top-handle bag, a beautiful lace-paneled top, and a shimmery infinity scarf. Have you ever read Dune, for a class or for pleasure? Have you ever read another work of fantasy or science fiction similar to Dune? What did you think of the novel, its grandiose scheme, and the elements at play within the plot? Have you seen the movie or the miniseries? What do you think of the outfits and styling tips? Let me know, in the comments below!